Can I decorate my flipping page with SWF flash file? Of course we all wish the digital book can become more interactive so that it can attract more attentions and brings different feelings. Like the magic book in the fairy tales comes up, at present, you can become common electronic PDF to fantasy magic book which can surprise you very much. FlipBook Creator Professional for MAC allows you decorate the plain book with flash SWF files. 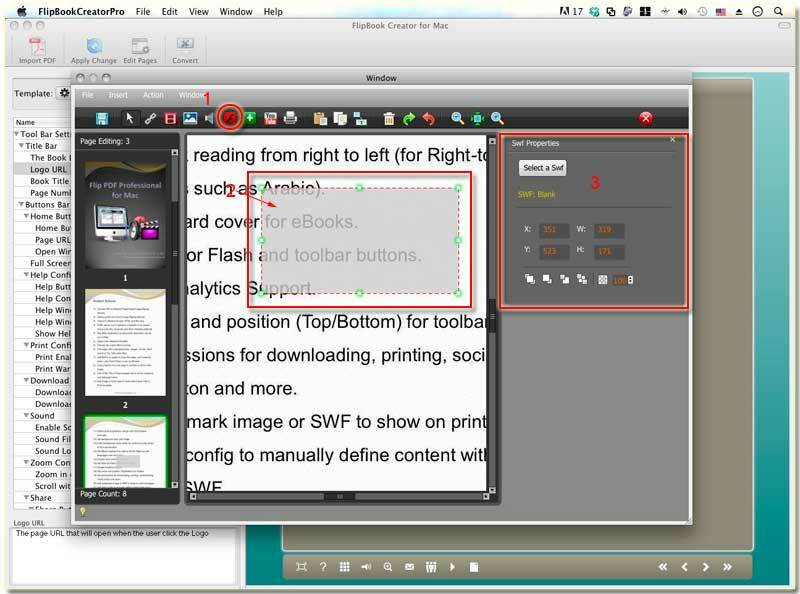 Step1: Launch FlipBook Creator Professional for MAC, import a PDF file. Step2: Click the icon on top menu line “Edit Page”, step into the new interface, click on page from the left page list to select. Step3: click “Insert --> Insert Flash”, and then circle an area on the current page. Step4: in the left window of Swf Properties, click the button of Select a Swf and load one from local disk. Note: you can add several flash files in the same pages and then setup their stack-up levels. Add animated flash will make the digital flipping book more attractive.